On Sunday 5.8. the cyclists took part in a road race. Following the persistent health problems that had dogged him since the spring, Ivo was feeling great and in excellent form. You could see the results of the concluding preparations that Ivo had undertaken in the Austrian Alps and which had restored his confidence in his own body. The road race track was based on a 13.5 km long circuit, which was the same as the road time trial. From the very start the competitors faced a long climb winding along the narrow lanes of old Maniago, followed by a dangerous descent with just crash barriers and a deep chasm on the left. The dominant feature of the descent was a narrow ancient bridge, where we saw several dangerous falls. From the very first meters of the race the cyclists tried to decide the race by attempts to take the lead. Ivo held back tactically, and even in the most difficult places he was in about 5th place. The third lap saw a very promising breakaway with Ivo and a Canadian, Australian and Columbian cyclist. This group was pulling away second by second, but unfortunately the arrival of the competitors who had started a minute before Ivo's group was to prove fateful for them. The judges stopped the leaders of the group, and they came in with the pack. At this moment it was clear that on such a hot day (35°C) no one would pull away again, and the competitors would have to concentrate on the final spurt along the paved road leading to the square in Maniago. About 700 metres before the arrival at the final left-hand bend, four cyclists occupied the entire width of the road and had no intention of letting anyone pass. 500 metres before the finish line Ivo decided on a hard attack along the edge of the road, and he flew past these tactically riding competitors on the right. Ivo was in the lead and flew into the final bend at high speed. But this took Ivo toward the barriers. Ivo had to ease off a little, and cyclists passed him on the left. Ivo could not regain top speed and came in ninth. Ivo showed that he has the heart of a fighter and knows how to take risks, although his luck ran out a little on the very last bend. The race was an illustration of the great work of the Italian organisers, skilfully assisted by the Army. And if we add the streets full of fans to this, it was a joy to compete in this race. 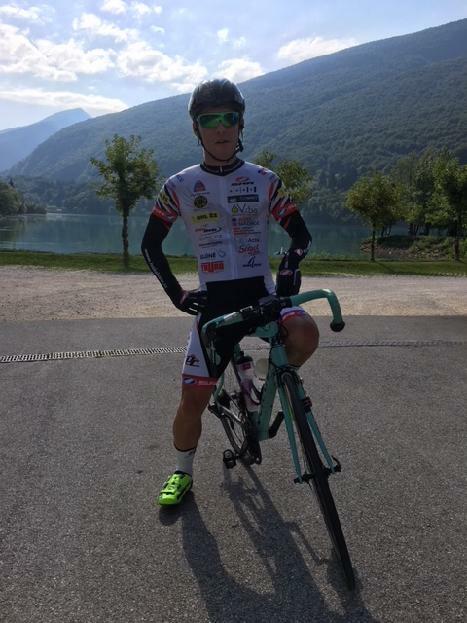 We congratulate Ivo and wish him many such races, and next time a little cycling luck.